Chewing your food the right way has a lot of magic. Right from losing weight and to make sure the nutrient that you eat are completely absorbed into your system. The number one cause of bloating, flatulence, indigestion, constipation, diarrhoea, and acidity could be due to the way you chew your food. The digestion of the food starts in your mouth; NOT in your stomach! It’s extremely important to understand your saliva has a role to play in the digestive process. There is a reason why we are born with teeth and there is a reason why we have saliva in our mouth that keeps generating all the time. Your mind gets sated in 14 to 15 minutes! Each time you sit down to eat, your mind gets sated in 14 to 15 minutes and thats roughly the time you spent each time you pick up your plate and start eating. Your body knows exactly what you need. They say, you are what you eat. Yes, it does matter a lot - what you eat, how you eat, and when you eat. The problem is you are habituated to eat more than what your body requires - by swallowing or drinking the wrong way. Your brain takes all the signals from your saliva when you eat. Your brain prepares your gut, the second brain as it's called, to produce all the acid required to digest the food according to what you eat. But since most of us wolf down the food and fill up our intestine, the brain doesn’t receive enough to prepare your gut to break down the food so that the nutrients in the food can be absorbed efficiently by the body. As a result, the food remains undigested and toxic, and you contribute to the likelihood of your falling sick. 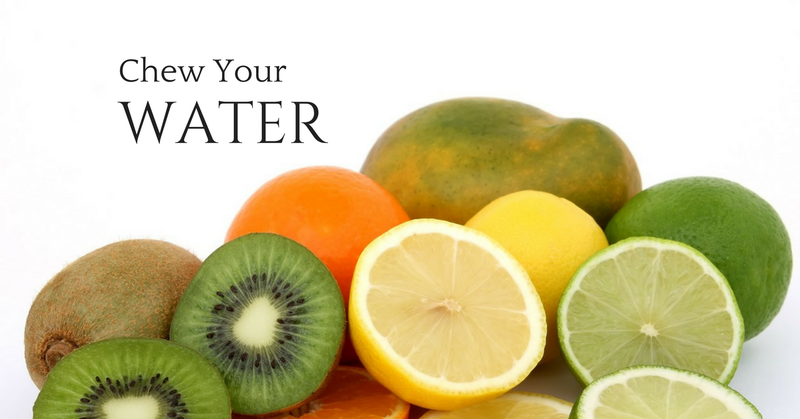 Fruits & vegetables can hydrate your body twice as effectively as a glass of water! Most of us chug water and within 20 minutes pee a clear liquid out, which suggests that your body did not absorb the water. Therefore, drinking too much water is actually depleting your body of vitamins and minerals! Fruits and vegetables can hydrate your body twice as effectively as a glass of water! So, turn off the tap and start eating our water instead. Chew your food 40 times or till it goes into a liquid form before you push it down to your stomach. Our bodies need water to function - anything from 1½ litres to three litres a day depending on body size and exertion. Almost all food we consume has some amount of water in it (even a slice of bread can have as much as 33% of water). 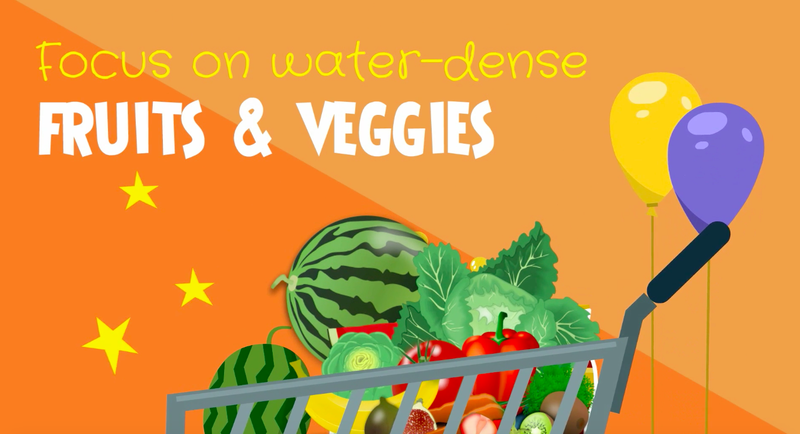 Fruits and vegetables are the most water-laden - cucumbers, lettuce, pineapple, watermelon, radishes are rich in water content. Cells throughout your body gradually dry up as you age! 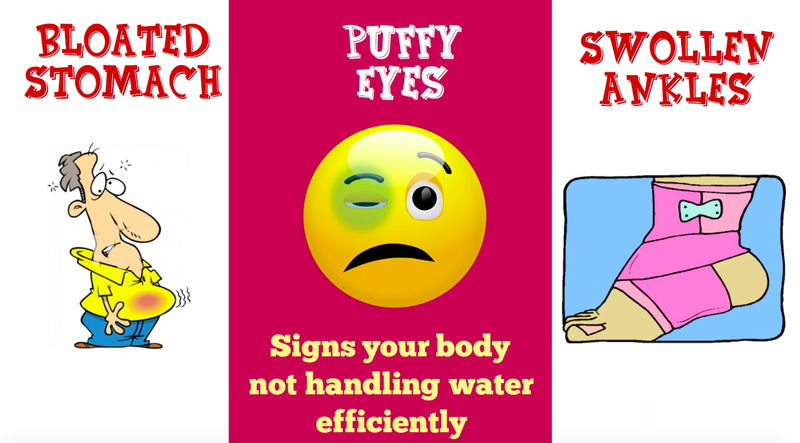 Puffy eyes, swollen ankles and a bloated stomach are all signs of a body that is not handling water efficiently. Getting the right amount of water into your body is the secret to glowing skin - particularly in middle age. The cells throughout your body gradually dry up as you age, by the time you are 50, you have only close to 50% of water in your body and you had 75 to 80% at birth. 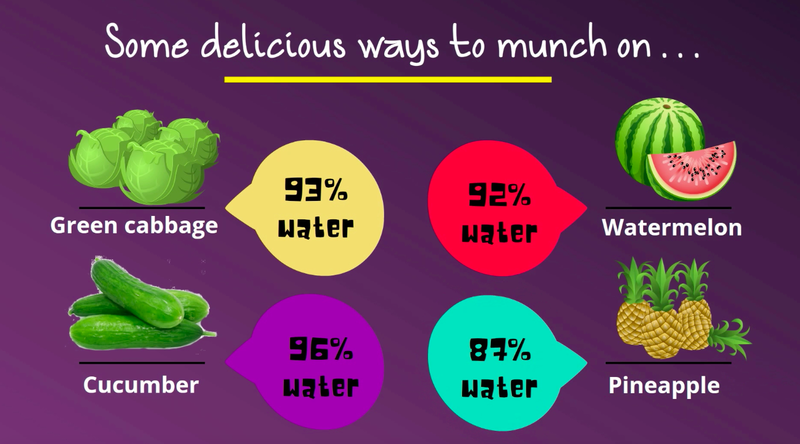 When we eat water-rich foods, we absorb water more slowly, which means the water in food stays in our bodies longer, and it brings a multitude of additional benefits. Focus on water-dense fruits and veggies., smoothies, chilled soups, salads. Combine water-dense foods like fruit with super nutrient-dense foods like greens for the best effect. 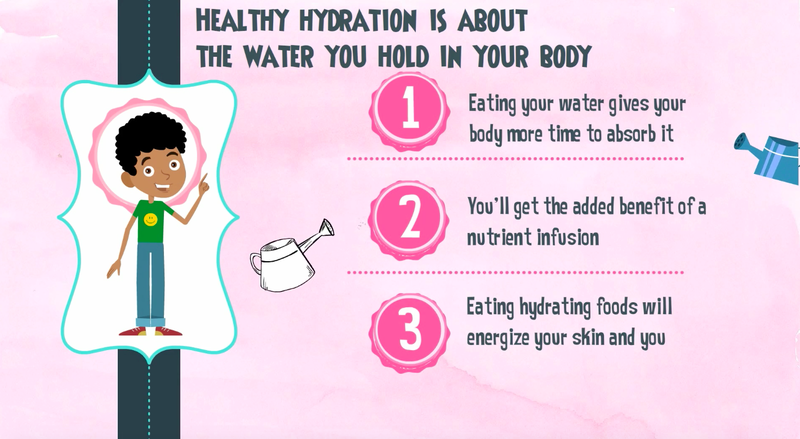 Healthy hydration is all about how you hold water in your body. Focus on the strategy to hydrate yourself so that water is available to your cells throughout the day. Remember, if you replace at least one glass of water a day with one serving of raw fruits or vegetables, you will be able to stay hydrated significantly longer. Make yourself relevant and enjoy the moment you are in!